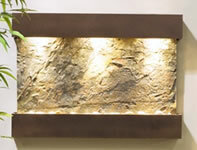 With their distinctive and exciting styling, our artistic wall mounted fountains offer a unique choice for enhancing an environment, while taking up no floor space. 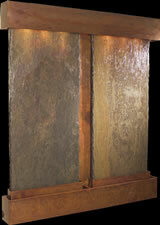 Our slate wall fountains feature contemporary stainless steel rustic copper and new antique blackened copper frames. As beautiful as they are impressive these fountains add visual drama to any room creating a focal point that adds grace, luxury and interest. 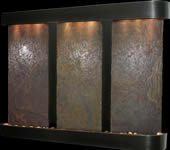 Have your fountain personalized with your name, logo or sentiment! Laguna Can take your provided graphic or idea create a one-of-a-kind composite of your finished customized fountain in 3 business days or less! 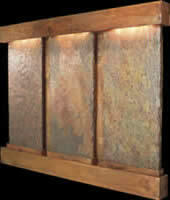 Click here for available fountains and more information. Water fountain pumps work best with distilled water. Pumps can be adversely effected by mineral deposits found in tap water over time. To keep your fountain running in peak performance we suggest using distilled water and do not turn your fountain on and off frequently as this will void the warranty.